What to say in July? 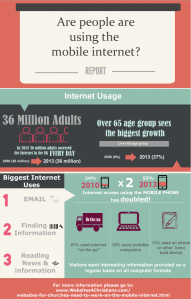 A quick post today to show you our latest infographic about websites. Today more and more people access your website from their mobile phone or tablet. So it’s important to make sure that your website respond to the various device sizes. Often Church websites are built only for desktop machines and as a result they are cutting out a lot of younger people who only look on other device types. If your church is one of these churches then why not have a look at our infographic which gives a summary of the key points and then get your website updated. It doesn’t take too much effort and it will enable lots of people who can’t currently see your site to get access. This website was designed and built by www.websites4christians.com.